Renalt Traffic van seat covers- one single and one double. - It is extremely comfortable to sit on. - It is warm in the winter but has a cooling effect in the summer. - It is naturally lusturous which gives the fabric a bright shine. - The stretch quality of the fabric not only adds to its durability of the seat covers but also makes it a very good fit for your van seats. - Fully washable and a cool wash is recommended for the product. 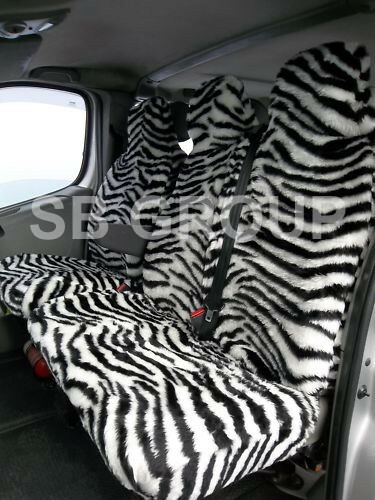 Our Renalt Traffic van seat cover will give you 1 single drivers seat cover, and a matching double passenger seat cover (on the back of the seat cover we have used the same heavy fur fabric). Driver Seat Cover: The driver’s seat cover is designed to ensure that apart from complete protection to your seat, there is a remarkable increase in the comfort level which brings about a refreshing change to your driving experience. - Kindly tell us about the number of arm rest/s opening/s (none, one or two) you will require, if any, and we will accordingly leave the opening/s for the arm rest/s to come through. Double passenger seat cover: The double seat has a 2" velcro fastening which will allows the centre seat belt to come through. All the seat belts are functional. Looks and quality is important but safety is paramount. -Kindly note that this double passenger seat cover is in one piece. If you need we can modify the double passenger seat cover into one top section and one bottom section- which will be slightly dearer. Please call us or email us. We have over 29 years of experience of manufacturing Renalt Traffic van seat covers we know that the seat covers are not just to protect your seats, but also, to enrich the comfort for the drivers and enhance the appearance of your vehicle interiors. 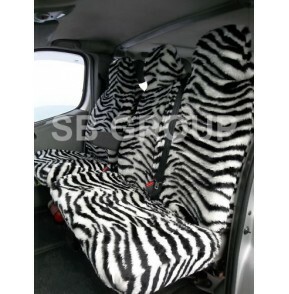 This Renalt Traffic van seat cover enhance the looks, increase the life span of the original seats, remarkably improve the resale value of your van and enrich the comfort factor and thereby add to your driving experience. Once fitted, you will have the peace of mind that your seats will remain in a pristine condition. For further details please feel free to email / telephone / arrange a visit.